GRENADINES OF ST.VINCENT 1978 BIRDS & THEIR EGGS UNMOUNTED MINT STAMPS SET SEVERAL OF THESE STAMPS HAVE MARKS ON THE BACK OF THE GUM . 1985 Birds. SG 845-861. ST VINCENT. The SG number is given for a guide only. Mint Never Hinged. MNH - Mint Never Hinged. MLH - Mint Lightly Hinged – Good clean stamp with little or no hinge remainders. 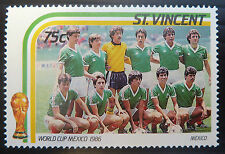 ST VINCENT 1976 BIRD WITH NO WATERMARK SG 489a MNH. ST VINCENT. 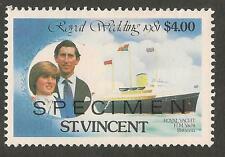 FINE UNMOUNTED MINT. St Vincent. mint never hinged. The set is dedicated to Masked Booby Sula dactylatra. -:- The item you receive may not be the item scanned, but will be of similar quality. Date of issue: 02 May 1995. No Exclusions. Glauben Sie, dass der Preis ist nicht richtig?. The set is dedicated to Masked Booby Sula dactylatra. -:- The item you receive may not be the item scanned, but will be of similar quality. Date of issue: 02 May 1995. No Exclusions. Yvert No. : 2414-2417. Stanley Gibbons No. : MS2898. -:- The item you receive may not be the item scanned, but will be of similar quality. Condition: Mint Never Hinged. No Exclusions. ST VINCENT 1946 VICTORY 1½d WITH 'SMALL BIRD IN WATER FLAW' R 9/4 SG 160 MNH. ST VINCENT. 1946 VICTORY 1½d WITH. 'GOLDBERG 1946 VICTORY ISSUE' CATALOGUE. 'SMALL BIRD IN WATER FLAW' R 9/4. MINOR CONSTANT VARIETY AS LISTED IN. FINE UNMOUNTED MINT. Humming Birds and Hibiscuses Set. SG: 487/91. Mint Never Hinged. See Scan. The flat rate cost of this service is £9.99. Grenadines of St Vincent. mint never hinged. in good condition. Saint Vincent Scott# 279 - 94, complete mint set, post office fresh, original gum, Never Hinged, VF. 2018 Scott catalog value $30.20 US. ST VINCENT Grenadines. 1978 Birds & Their Eggs. MLH - Mint Lightly Hinged – Good clean stamp with little or no hinge remainders. The SG number is given for a guide only. Used - used and in a collectable condition. :- The item you receive may not be the item scanned, but will be of similar quality. Year of issue: 2001. No Exclusions. Glauben Sie, dass der Preis ist nicht richtig?. Here is a mint never been hinged set from St Vincent of 1985 titled Leaders of the World Birds. SG.285/300. Unmounted Mint. (SALE WEEK.3). SEE PHOTO. This is a single with a double overprint SG.11a in unmounted mint condition but sadly suffers from a small tone spot on the bottom left hand corner perfs on the reverse of the stamp and not noticeable from the front and has a SG.catalogue value of £130,so this is a cheap priced filler. This is the beautiful birds set issued in 1970. Complete set. The set is dedicated to Masked Booby Sula dactylatra. Scott No. : 2156 a-d. No Exclusions. Date of issue: 02 May 1995. Yvert No. : 2414-2417. The set is dedicated to Masked Booby Sula dactylatra. Scott No. : 2156 a-d. -:- The item you receive may not be the item scanned, but will be of similar quality. Date of issue: 02 May 1995. No Exclusions. ST.VINCENT = BIRDS / EGRETS S/S MNH E=B2 DON'T WATCH IT - BUY!! !